The kids are back in class and after-school activities are in full swing again. Soccer practice, dance, gymnastics, piano lessons, baseball…it’s already a blur! Amidst the whirlwind, it’s imperative that you take a moment to assess: does my child have a schedule that promotes an active mind, exercises the body, provides down time, and feeds their individual expression and creativity? This translates to a healthy mixture of academics (mind), physical activities and rest (body), and creative arts (soul). As parents, it’s our responsibility to prepare our kids for the world and set them up for success. This starts with achieving a well-rounded childhood. Luckily, we can count on our kid’s daily-dose of school to auto-administer many of the important academic subjects. In some cases, there may be a need for more additional tutoring to both challenge students beyond the school classroom, and to reinforce what is being learned in school. With new learning approaches, techniques, and topics in schools it can be difficult for parents to help with homework. Outside tutoring or study groups can provide the assistance and time to complete homework assignments with better accuracy and understanding. Physical activity and proper nutrition are equally as important to the well-being and development of our children. Being outside clears our mind and prepares it for an influx of new information throughout the day. Harvard’s Department of Environmental Health reports that on average, people today spend less than 5% of their day outdoors – not nearly enough! Understandably, team sports can be a serious time commitment. Soccer practice twice a week or more, games on Saturdays, baseball on Wednesday nights, not to mention gymnastics competitions and cheer try-out…you’ve become an honorary Uber driver and no wonder everyone is exhausted! If your clan’s schedule is tight, instead consider un-organized physical activities. Unlike team sports, these ideas are inexpensive and much more flexible! Recruit neighbors for pick-up games, hit the pool, or go for a hike. Quality time spent outdoors together creates lifelong memories and allows children to learn from each other and their environment (and from you, their parents!). Make it a point to walk your pup together every morning or shoot hoops in the evenings. Un-organized physical fun will set you and your family up for a more relaxed, productive week and still allow time for a family dinner in between. Research published by the University of California, Irvine shows that early music training dramatically enhances children’s abstract reasoning skills and higher brain functions required for mathematics, chess, science, and engineering. The Texas Commission on Drug and Alcohol Abuse reports that students who participated in band or orchestra reported the lowest lifetime and current use of all substances (alcohol, tobacco, illicit drugs). See more from the the NAMM Foundation who has been actively researching and supporting the importance of music education. Creative arts can provide the foundation for success on all fronts when continued over time. 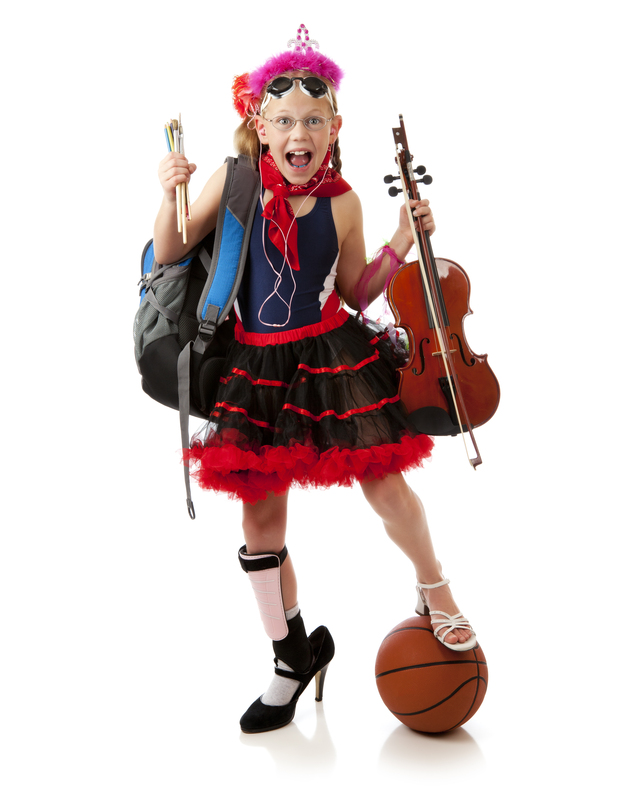 Encourage your child to participate in dance, choir, art classes, or instrumental music such as band or orchestra. Concerned that you don’t know enough about the arts to properly support your children’s endeavor? Consider enrolling kids in lessons and make it your goal to provide your children with consistent affirmation and praise. There are program where you can also learn along with your child. The more interest you show in their budding talents, the more interested your children will be to participate. Children feed off of your positive (or negative) energy. Overall, it’s essential that your family starts off the school year with a healthy, balanced schedule. Otherwise, you’ll find yourselves burnt out before the holidays begin. If you realize that you’ve over-committed, it’s time to re-evaluate and re-balance. You may need to sacrifice a sport in order to make time for an art or vice versa. Be sure that all of your family time isn’t being absorbed by one single genre. Our children need a balance of all three – mind, body, and soul-feeding creative arts – in order to thrive.